A Special Disbursing Officer (SDO) is a duly appointed disbursing officer assigned for a specific time-bound, legal undertaking. For research projects/programs, the SDO is usually the Project Leader/Program Leader/Principal Investigator. S/he has the authority to request for, disburse and liquidate special cash advances for current operating expenses. As a SDO, the Researcher is deemed an Accountable and Bondable Officer. Every officer, agent and employee of the Government of the Philippines or of the companies or corporations of which the majority of the stock is held by the National Government, regardless of the status of their appointment shall, whenever the nature of the duties performed by such officer, agent, or employee permits or requires the possession, custody or control of funds or properties for which he is accountable, be deemed a bondable officer and shall be bonded or bondable and his fidelity insured. The request letter is endorsed by the Dean/Director, the Vice Chancellor for Research and/or the Vice Chancellor for Administration, and approved by the Chancellor. Once the request has been approved, it will be forwarded to the Human Resource Development Office for drafting of the Administrative Order (AO). The AO will be signed by the Chancellor and forwarded back to the unit. 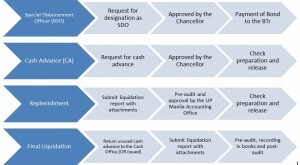 Once bond has been paid, the Researcher will receive a Confirmation Letter containing the name of the SDO, the Risk Number, Approved Amount of Bond and Effective Date. This document is attached to all subsequent requests for cash advance. Once the bond has been paid, the Researcher can now request for a cash advance equal to the amount of his/her cash accountability. The bond needs to be renewed yearly, before the date of its anniversary, otherwise the bond is automatically cancelled. 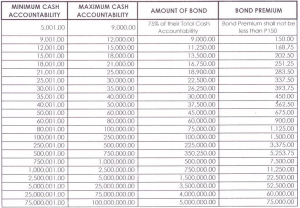 Any increase in the amount of accountability, resulting to an increase in the amount of bond shall be subject to increase in premium. The amount of bond premium shall be computed based on the increased amount of bond. The bond shall take effect upon the time of payment of premium on the new bond application. Once the request has been approved, it will be forwarded to the Human Resource Development Office for drafting of the Special Order (SO). The SO will be signed by the Chancellor and forwarded back to the unit. Once the bond has been paid, the Researcher can now request for a cash advance equal to the amount of his/her increased cash accountability. No cash advance shall be given unless for legally authorized specific purpose. No additional cash advance shall be allowed to any official or employee unless the previous cash advance given to him is first liquidated and accounted for in the books. A cash advance shall be liquidated/reported on as soon as the purpose for which it was granted has been served. Except for cash advances for travel, no officer or employee shall be granted cash advance unless he is properly bonded in accordance with law or regulations. The amount of cash advance which may be granted shall not exceed the maximum cash accountability covered by his bond. Only permanently appointed and duly designated disbursing officers shall be granted cash advance. However, these requirements shall not apply for cash advances for travel. Transfer of cash advance from one accountable officer to another shall not be allowed. The cash advance shall be used solely for the specific purpose for which it was granted. Under no circumstances shall it be used for encashment of checks or for liquidation of a previous cash advance. No cash advance shall be granted for payments on account of infrastructure projects or other undertaking on a project basis. Cash advance for special time-bound undertaking shall be liquidated by the accountable officer concerned within one month from the date of the purpose of the cash advance was accomplished. Cash advances which are no longer needed or have not been used for a period of two months shall be returned to or deposited immediately with the proper collecting officer or treasurer. All cash advances shall be fully liquidated at the end of the year. Except for petty cash fund, the accountable officer shall refund any unexpended balance to the cashier/collecting officer who shall issue the necessary official receipt. The special cash advance shall be used to pay the salaries and wages of the employees and the miscellaneous operating expenses of the activity. Payment for each transaction shall not be subject to amount limitation. However, all payments shall be approved by the Director/Head of Field Office. The amount of cash advance shall be limited to the requirements for two months. Within 5 days after the end of each month, the AO shall submit a Report of Disbursements. Additional cash advances shall be granted on the basis of the activity budget or the requirements for two months, whichever is lower.